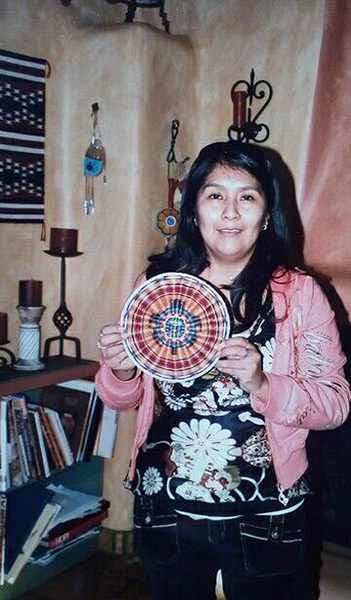 Annetta Koruh is a Hopi basket weaver from the village of Bacavi on the Third Mesa. She represents the fourth generation of basket weavers in her family. In Hopi tradition, basketry is a spiritual and healing practice. 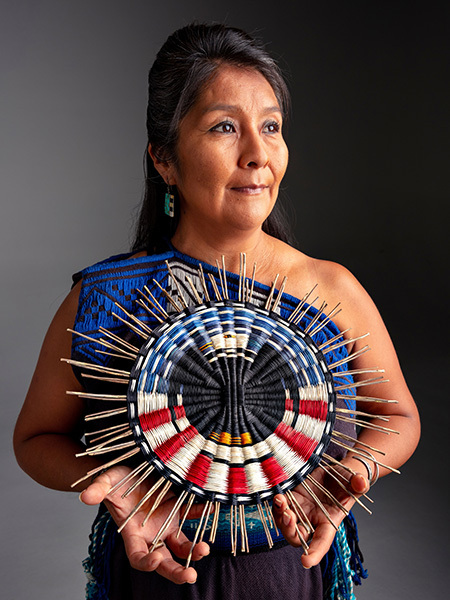 Annetta is a recipient of a 2018 SFA Master-Apprentice Artist Award, which has supported her in teaching Mckenna Nachie, a college student who shares Annetta’s clan and has been observing different forms of basketry since fifth grade. Who taught you to weave baskets? I grew up around it. My great grandma—who they said was between 105 and 110—she wove baskets and my grandma wove baskets and my mom wove baskets. They had weaving parties at the house. A weaving party is when you invite weavers to your house and weave to pay back for a favor. When you get married the Hopi way, the man’s family gives the bride lots of gifts, such as wood, sheep, traditional robes, and groceries. Once the wedding is done, the woman in return gives the man’s family gifts of baskets, which are also prayers. It’s always about being grateful and thankful for what you get in life. Growing up I had an “I don’t care” mentality. I went off to school, but there was a wound in me that led to self-destruction and self-protection. After I graduated high school in the city and went to some college, I got in more trouble because I was looking for love in all the wrong places. Nothing in the city life was sustaining. I became suicidal. I didn’t know how to deal with my emotions. I had witnessed my mother being beaten and us being beaten and so there was brokenness that I carried. 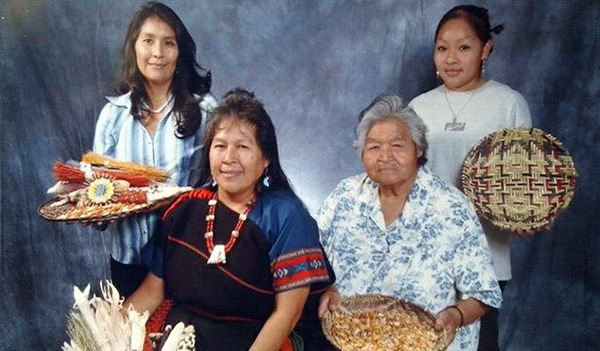 Annetta Koruh and the women weavers in her family. When I came home, I saw how calm and slow-paced the women were when they were weaving–that prayer, that relationship, that state of mind. I was drawn to it. I was looking for that unity in myself. My great grandma, grandma, and mom, they all that relationship with creation. I could see in them the peace that I longed for. I would go out picking plants and dyes, and would love to see my grandma interact with creation. 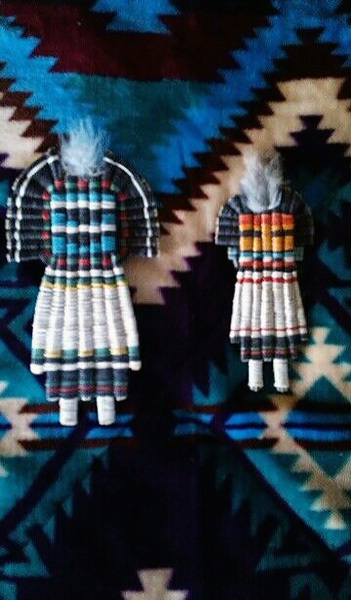 She only spoke Hopi. Only when she was on her deathbed did we learn she spoke English. But it was a good thing because we learned the language. I didn’t know how to put a basket together, so I asked my mom to just help me get started. All I wanted to do was learn how to put it together, so one day I hid my mom’s tools. I let her look around for them after lunch. After a while, I said, “If you help me put together the basket, I’ll give you your tools back.” This day she sat down and taught me how to do it. We weave differently, because I’m left handed, but that was the day a fourth generation basket weaver was born. After that, it just came to me and I picked it up by watching and being with the women. Sometimes when I was learning I would rip it and break the basket and be frustrated, but my great grandma would say, “Put it down. Go take a walk and go deal with what you’re dealing with and come back.” And it was amazing to go out and cry and let out whatever I was dealing with. It was showing me that I was still healing. Basket weaving helped you heal? I used feel abandoned and alone in myself. But then I would be driving by and see the weaving supplies—the plants we use—and they would be waving to me. I would always remember my grandma saying, “Thank you for growing. You look beautiful.” The weaving supplies that we use are rabbit brush, dune brush, and yucca. In our creation stories, we humans were dirt and we were blown into and given life. It’s the same thing with these plants–they’re birthed from the dirt. Our relation with creation is evident all around. I hadn’t seen it before because of my blindness and my hurt. I had gone to medicine men and counselors and groups and through those things I was taught how to maintain my mind and discipline my emotions and my physical well-being. But what was broken was my spirit. And in those places, they don’t teach spirituality. When my great grandma would say, go out there and pray, you go out there and speak your prayers and something just speaks to you. For me it was a butterfly. It was flying around and I would see how free it was. I would remember that it wasn’t always that beautiful, but it had to struggle to get out of that cocoon. That was the start of my freedom, by not denying what had happened to me in my life. The weaving took me out in to nature. They say nature heals. During the time I was going through healing and transformation about my outlook, I used to wonder, What is my place? You have those inner voices and all of the sudden an inner voice was like, “Put up your hand.” So I put up my hand and I was looking at it and moving it. “Do you see what’s helping the hand to move?” No, there’s tendons and muscles and veins and nerves and blood but I don’t see it, and all of the sudden it was like, “Well, I see it. I see what you’re doing to help creation move.” It was an inner spirit speaking. 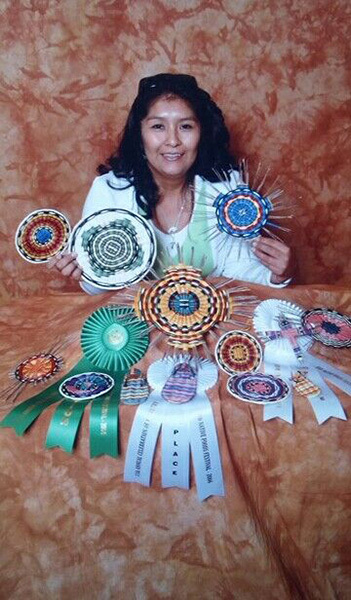 Annetta Koruh and some of her awards. Regardless of anyone’s outlook on me, I have the creator’s confidence in what I’m doing. After losing all that self-esteem, I can finally grasp the purpose I have in life as a weaver. I’m at a point where I’m pretty patient but I still have work to do. But struggle is necessary. So is surrender. Basketry for me is a visual teaching. It has been a way for nature to heal me through meditation, being still and quiet and waiting for your prayer to be answered. Sometimes we are so rushed in our busy days that we don’t just sit and be. It’s evident that I would be dead if I hadn’t incorporated that into my life. Can you talk about what you pray for and what designs come to you? When people see a finished item, they don’t know what went into that basket. There’s storytelling in that. Every time, I’m praying, I’m asking: What design do you want me to make for someone? I pray for myself, that I won’t put anything negative into it, then for the person receiving it, then for the world. I looked up the cricket and found it was in my culture and it was, so I started making basket with a cricket design. A thermometer is something that measures cold and hot, so we need to have a balance in our lives. You’re going down the freeway, and you get so hot and heavy, you’re suddenly cursing someone else’s life. You’re unconsciously reacting, not consciously doing things. That is what came to me. If you listen to a cricket, within a minute it tells you the degree of weather. That’s how intricate the creator makes things for us to learn from. But we stop listening to the simple things. I just started crying. That man’s story helped me believe and grow my faith that the creator does know. The man said he was going to go home, put the basket on the wall, and use it as a reminder. To this day I wonder if he did. I am a godmother to nine children, so I have to make a basket for them every year until they go through rites of passage. I always pray for the designs. 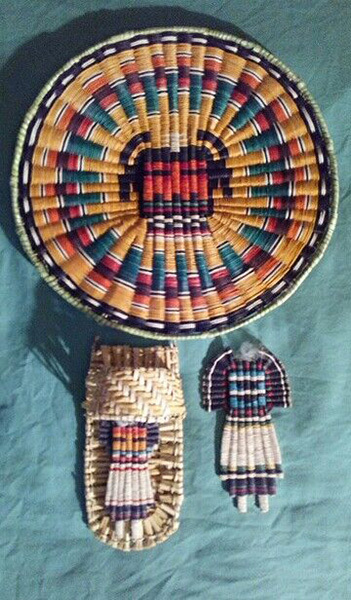 I ask the creator to help me know what to put in the baskets, what design to use. There’s always a story. And you don’t consciously think it, because it comes through the spirit. During the time I was trying to heal, I was going to all these self-help programs. They were all good, but they all taught different ways and it was too much. I felt like a failure because I couldn’t live up to the expectations. One day I was driving, and I saw this rabbit running to the road and I was like, “STOP.” But it didn’t and I ran over it. It was running to the light, but it got killed. That spoke to me. I was running to the light, but it was killing me. I was not very patient with myself. I just wanted to feel whole. That night I had a dream of the turtle and the hare. The turtle just casually going along, I’ll get there when I get there. They say a turtle is patient, has its own protection, and has a long life. The creator showed me that I was like a turtle and I needed to be patient with myself. So, when I make a turtle design, that’s what I’m praying for, that wherever there is brokenness or impatience or lack of understanding, for patience to grow. Butterflies, plants, turtles. It seems you really have gained a lot of wisdom from nature. It’s an important part of your work and your life. My Hopi name is Siikatalmana, a word used to describe the first light of day, when the sun is coming up, and the sky is orange and yellow, before it comes over the mesa. I like to get up early to see the day. Early in the morning, breathing in something good like love or joy or strength, all the way to my gut and then breathing out and releasing something negative. It’s an amazing feeling to know you’ve been granted another day to live your purpose. There’s nothing that compares to breathing in the new day. Great narrative. Thanks for sharing.